When I told my hubby - his response was basically "twenty toblerones please!" As tempting as that was, I actually went with a little mission in mind! You see, I'm planning to finish all my Christmas shopping before my little man's primary school finishes today - I do not at all want to be panicking, pressure shopping and taking two small people around over crowded shops! Instead I want to fill the very short bit of time from Friday to Christmas Day doing Christmassy things such as watching films, reading books, eating food and making our own decorations! With this in mind, I headed to poundland - I thought it'd be hard to find what I wanted and spend the whole of the £20 but actually it was very easy and I could have spent that twice over! • Toblerones! - only just 2 of them! • Lovely Scandinavian style printed paper chains - there are 120 self adhesive strips in the pack. 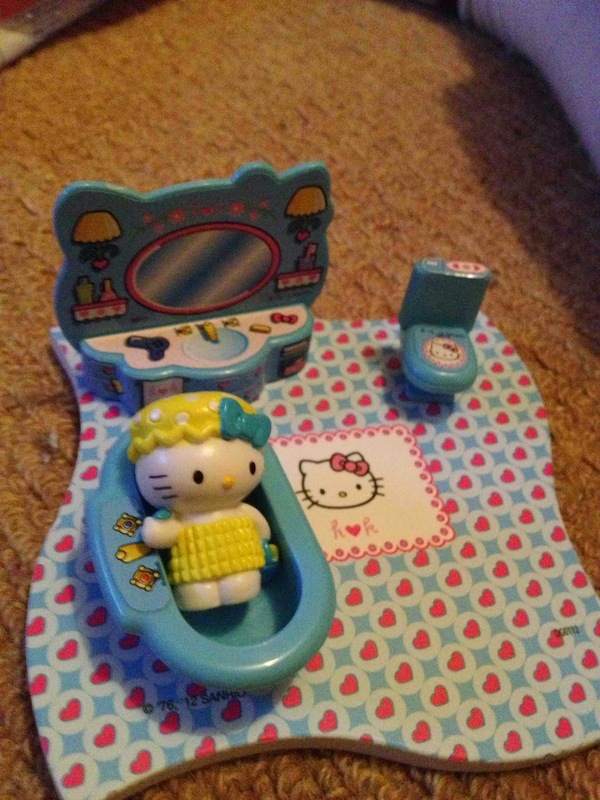 • A Hello Kitty bathroom playset - this comes with a hello kitty figure, a bath, toilet and sink. • A paint your own Christmas canvas - this comes with paint and a brush and has a printed picture. • Two chalk boards with chalk to keep both my little people busy at the table while I'm baking Christmas goodies. • A Pom Pom penguin to make - even comes with card circles so you can start making it straight away. • Little Miss Tiny story book. Both my little people love Mr Men and Little Miss stories and I was surprised by the wonderful choice of books. 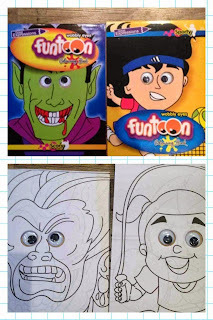 • A Smurf activity book full of colouring in pictures and puzzles such as mazes. • A snowman wicker wreath to hang on our door. • A pack of two colouring books with big goggly eyes - this just made me laugh and I knew my little people would find it funny too! 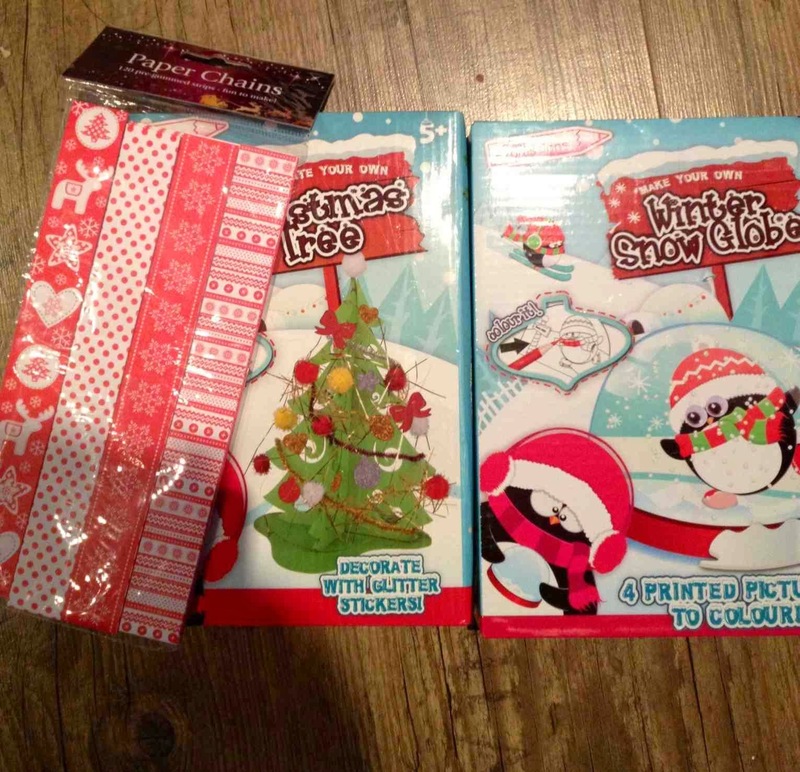 • I bought two make your own snow globes, my little ones can make one each and the pack comes with a choice of background pictures so they don't need to be the same. • AA batteries! Lots of them because we all know how many new toys will come without batteries! • AAA batteries because we all know that if I just bought AA's all the new toys will need AAA's - also a backup for the TV remote controller ha ha. 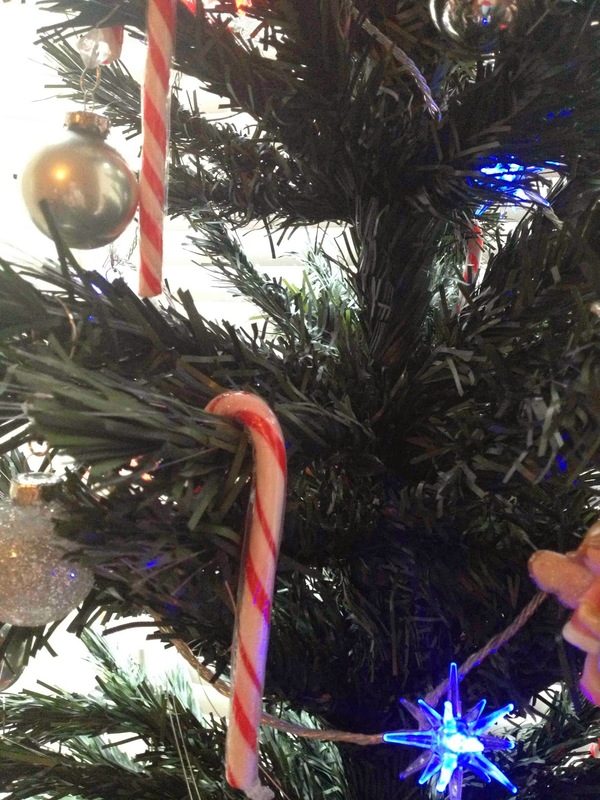 • A make your own Christmas tree - it's a foam kit that will be fun for the little people to make, lots of glitter glue fun to be had! 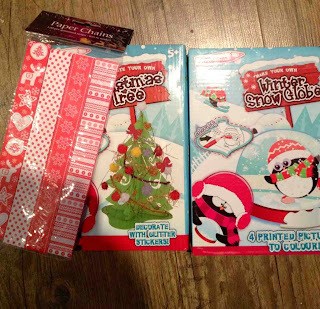 • A pack of Christmas Stickers - kids love stickers don't they! 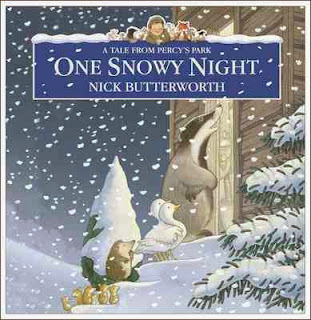 • One Snowy Night by Nick Butterworth - an absolute adorable little hardback book about Percy the Park Keeper. Poundland has now become my favourite little bargain book haven! I cannot believe the wonderful choice available for children's books, lots of popular titles and authours. 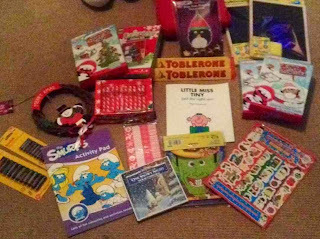 I was also surprised by the huge choice of chocolates in Poundland, including boxes of thorntons chocolates and snowman and snowdog goodies. There was a second part to the poundland challenge - a special blogger secret Santa! 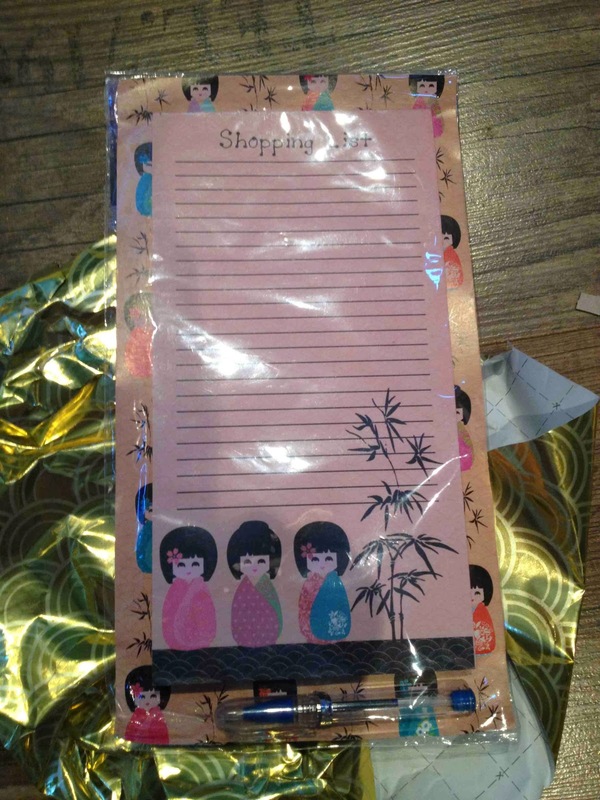 I received a lovely shopping list notebook :) a big thank you to my secret Santa - I'm a listaholic so a fab choice!